Traveling for work is a gift or a curse depending on where you go and even more importantly, where you stay. My husband, Andrew, is constantly on the road and he’s a sweetheart to invite me along. We recently got the chance to visit Amsterdam and headed there early for a weekend of fun and Dutch cheese. 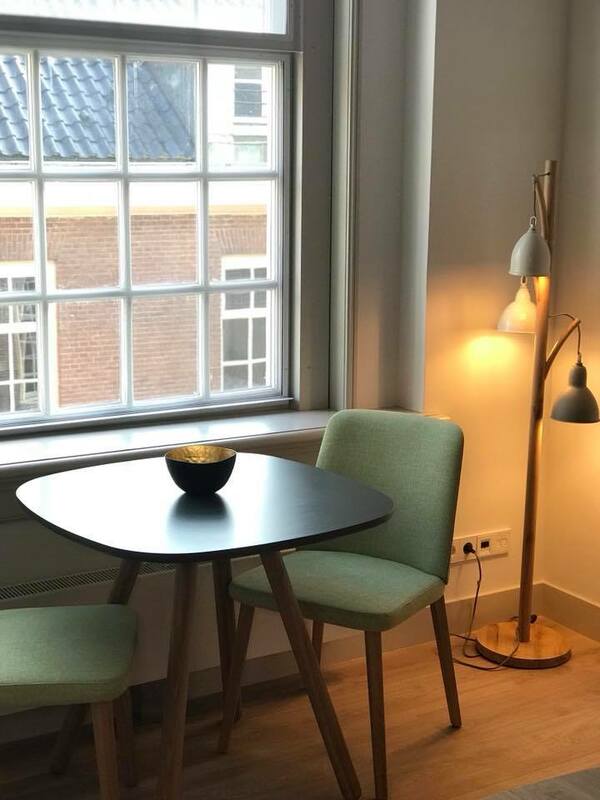 We stayed at The Wittenberg, a new boutique aparthotel right in the heart of Amsterdam. The beautiful brick building is just CHARMING. From the moment you pull up, the quiet street sends you into sensory overload. The peaceful canal. The old trees and their reflections on the water. The incredible architecture. You almost don’t realize you’re in the city. We were greeted by friendly faces and steaming espresso, the most welcomed of welcomes considering our jet-lag and the cold temperatures. We relaxed in the cozy lounge for a few minutes before making our way to our apartment. If you travel a lot, you can imagine our excitement as we saw THIS. The cutest and most SPACIOUS apartment we’ve stayed in on the road. A bedroom, bathroom, living room, and kitchen! Practically the Taj Mahal. There’s just something about that amount of square footage that immediately makes you feel relaxed and at home. Now, the part I’m most excited to tell you about.. the décor! Just LOOK at this couch! And those lights! And most of all, THESE WINDOWS! I was in Heaven. I ran to the bedroom window (look at all of those gorgeous panes!) to check out the view overlooking the canal. It’s something out of a dream. I also fell in love with the rustic beams across the ceiling in the apartment. The juxtaposition was magnificent. Such a new, contemporary look and feel yet these old, amazing touches. 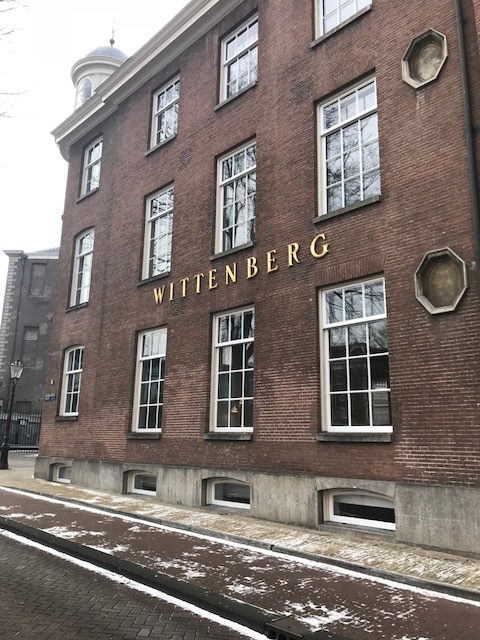 As it turns out, The Wittenberg building dates back to 1772 (yes, that’s before the U.S. was founded! ), where it’s been housing people for more than 200 years. 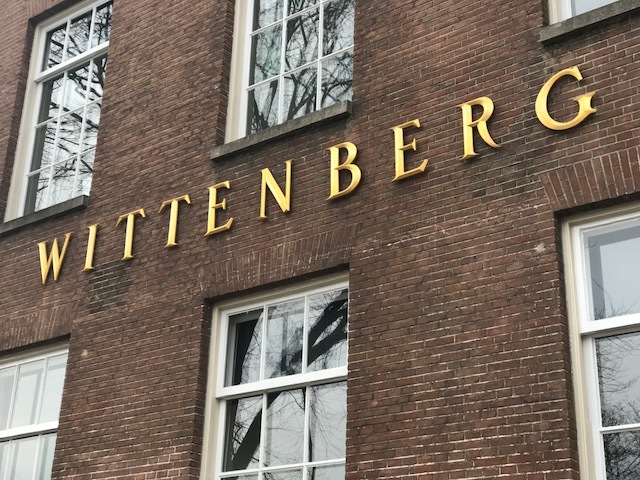 I noticed other charming touches like the beautiful brick courtyard in the center of The Wittenberg and the hooks used to hoist furniture into 18th century style buildings that you see across Amsterdam. One subtle highlight was the heating rack in the bathroom. First of all, the brand new bathroom was impeccably clean with nice shower heads and water pressure (this stuff matters!). 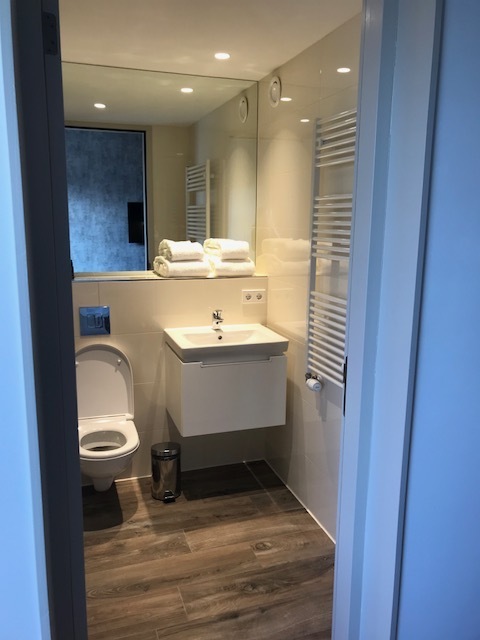 To the right, you’ll see the rack that heats your towel up while you’re in the shower. The little luxuries in life are not easy to forget. My husband and I even started looking for one of these online to install in our own bathroom at home. Speaking of little luxuries, the sweet staff at The Wittenberg left us this 'Welcome Home' Bag full of goodies. The staff members at The Wittenberg are just darling! They were very sweet to give us many recommendations on what to do and where to eat. 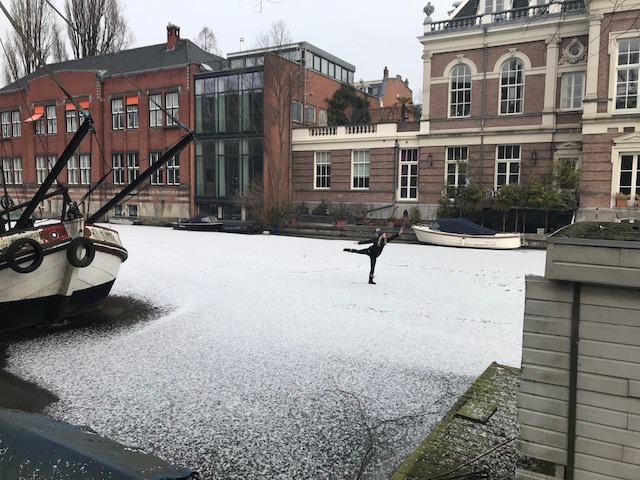 They all told us how lucky we were to get the chance to see Amsterdam’s canals frozen over – as that hasn’t happened in many years! So, we couldn’t pass up the chance to do this.. Walking on the frozen canal outside of "The Wittenberg" in Amsterdam. Yep, we walked out on the “water” – and I even pretended to be an Olympics figure skater because why not? I was inspired by others around Amsterdam who were literally ice skating up and down the frozen canals all over town. 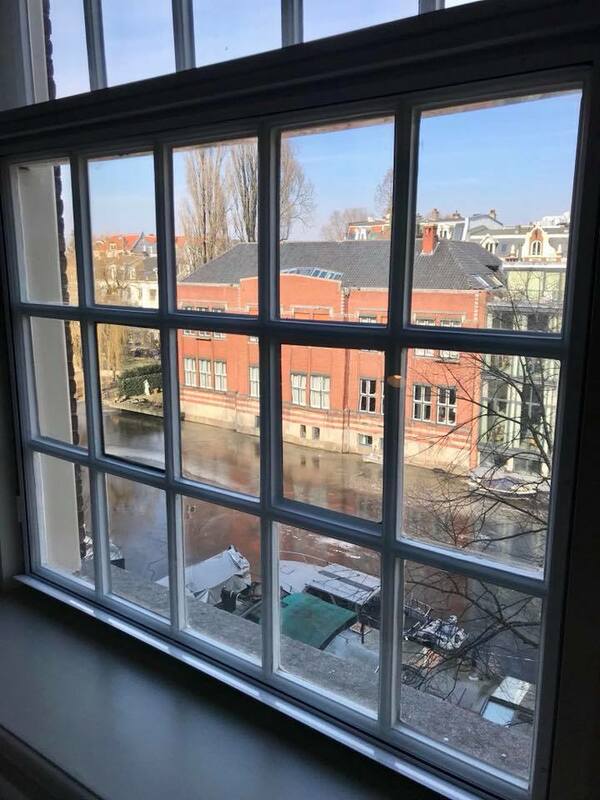 Other highlights of our jam-packed weekend in Amsterdam included tourist stops like the I Amsterdam sign, museums, a sightseeing canal boat tour, and a visit to the Anne Frank House to pay our respects. We also decided to spend a half day at Zaanse Schans for a very Dutch experience and eat our weight in cheese. Our favorite? Sheep cheese, it’s softer than normal cheese and a bit saltier too. We had a wonderful trip to Amsterdam and hope to be back sooner than later. 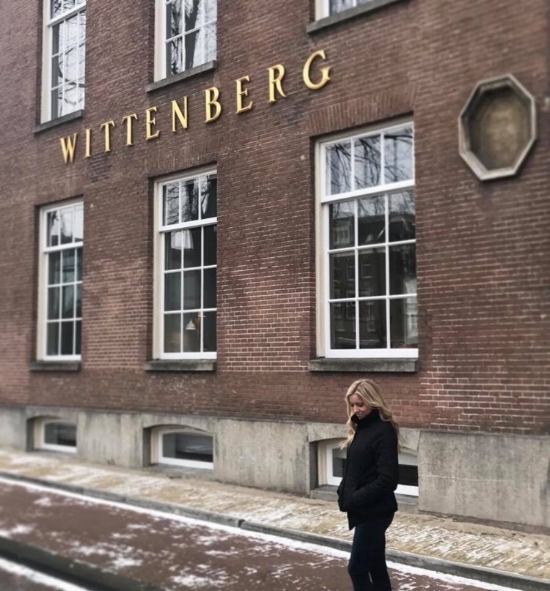 A special thanks to The Witttenberg for a fabulous stay at their beautiful aparthotel. Give them a visit next time you’re there!